Operationally, RFID offers low electromagnetic interference (EMI) properties, low cost, small size, low power, and battery-less technology capabilities. Additionally, Advances in RFID tag technology offer expanded memory capacity, enabling additional data to be stored on each tag, which helps to prevent counterfeiting and ensures product reliability. Data such as lot number, manufacturing date, expiration date, etc. can be written to the tag during the manufacturing process, while new information —such as shipping date, date of sterilization, or treatment history — can be added throughout the product supply chain and lifecycle. Moreover, a distinctive anti-collision scheme allows RFID tags to be individually identified, enabling accurate reading and identification of tags even in large batches, or inside packed boxes. Of course, reliable identification is crucial when dealing with logistics and tracking systems for medical devices and instruments. This importance is magnified when tracking biological samples in transit, or when verifying that a reusable piece of equipment has been sterilized. To that end, RFID tags are able to withstand harsh sterilization conditions, making them ideal for verification of sterilization, safeguarding against accidental cross-contamination with secure data that cannot be revised by unauthorized personnel. Finally, RFID tags can be attached to disposable parts to ensure that authorized parts are properly attached to the right equipment, minimizing the risk of misuse. Likewise, RFID technology can be used to ensure authorized access to controlled areas and cabinets for improved quality control. These are just a few examples of RFID being used for tracking and monitoring in healthcare. Yet, as medical device manufacturers implement RFID into their equipment, it’s important to understand how to address testing and safety with RFID, as well as compliance with updated IEC standards. Sterilization issues continue to plague hospitals and medical facilities, creating scenarios where preventable problems with equipment, and/or human error in protocols and training, lead to front-page news. In fact, there are companies whose sole mission is to fight infection in healthcare settings. One such company, Johnson & Johnson’s Advanced Sterilization Products (ASP), is a global developer of infection prevention solutions and educational programs. To help battle infection and maintain sterile environments, ASP developed a hydrogen peroxide, low-temperature sterilization chamber for hospitals and medical facilities. In order to provide complete confidence that medical objects are fully sterilized in the chamber, ASP began using RFID technology to ensure automated compliance on cleaning and reprocessing protocols. ASP outfitted its device with a high-frequency (13.56 MHz) RFID reader module, and each hydrogen peroxide cassette is embedded with a high-frequency (HF) RFID tag. RFID tagging the cassettes enables detection and alerts for errors, as well as ensuring that the cassettes comply with ANSI/AAMI/ISO standard 14937:2009. Thus, the system is able to offer secure identification of connected components and commodities (e.g., cleaning processes), identification of samples in a centrifuge, and staff authentication for secure access to machines and devices. Although companies like ASP have embraced RFID technology, obstacles exist that prevent its more widespread adoption. For example, some in the industry are concerned that electromagnetic emissions from RFID could interfere with medical devices. However, the U.S. Food & Drug Administration (FDA) has stated it has not observed any adverse effects from the use of RFID. Additionally, an Indiana University - Purdue University Indianapolis (IUPUI) research team concluded that a properly configured RFID system is safe to use around medical equipment. Still, while the risks are considered minimal, medical device manufacturers and system integrators should conduct their own EMI assessments in a safe environment to ensure both safety and regulatory compliance. devices can be made even smarter. OEMs must seek out progressive RFID manufacturers that can supply FCC-certified RFID read/ write modules, antennas, and enclosed readers, supporting temperature and moisture-sensing applications. Considering the end user, though, OEMS should pay careful attention to the readers accompanying their RFID systems, ensuring that those readers meet the benchmark of IEC 60601 certification. Coupled with hands-free data capture and no required line of sight, this new generation of readers can continuously and automatically search for RFID tags entering their field, allowing for enhanced tracking. Some readers even are enabled with an HID key code interface to easily replace magnetic stripe for access control. Medical facilities and the medical device industry will demand greater capabilities and operating safeguards from equipment and component suppliers as OEMS are pressed for greater performance and safety. By integrating reliable, easy-to-use technologies sooner rather than later, medical staff can concentrate on the job that matters most -- delivery of quality patient care. 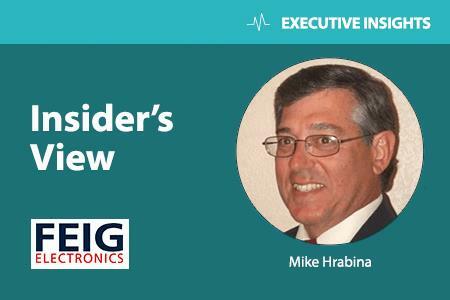 Michael Hrabina is executive vice president of FEIG Electronics, Inc. Mr. Hrabina is a career-pathed executive with wide-ranging technical, professional, and personnel skills, combined with a rich, well-rounded work history. Roles in sales, marketing, and strategic business development broadened his capabilities for use in executive level positions that have included chief operating officer, VP of sales and, most recently, executive VP. Mr. Hrabina brings to Feig Electronics hands-on experience with mission critical identification systems used in automated control systems, and excels at applying his technical understanding of data capture equipment to a solution.